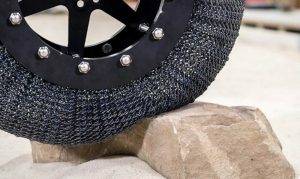 NASA research engineers have unveiled super-elastic titanium spring tires that will help rovers designed for extraterrestrial surfaces to carry heavier payloads and explore larger areas for longer periods of time. Researchers foresee that these new tires could also be used on manned exploration vehicles that would move at much higher speeds. The design of NASA’s new tire is also a result of an issue that occurred with a tire used for the 1971 lunar rover, which was brought to the moon by Apollo 15. The lunar rover’s wheels were made of hollow metal springs. They could absorb shocks like a rubber air-filled tire, but they didn’t roll efficiently since those metal springs became deformed over time to the point at which they couldn’t return to their original shape. To solve this issue, researchers came up with a new type of metal spring tire made from a nickel-titanium alloy. This latest innovation is the result of years of efforts by the engineers and scientists. This airless tire features 800 load-bearing springs. It will be able to bend, adapt, absorb shocks, and then regain its shape — even after crisscrossing the most difficult terrains. In fact, this tire is based on the award-winning airless “Spring Tire” that NASA developed with Goodyear back in the mid-2000s.